The Tre Mercarti Dual Flow Mono Sink Mixer with a swivelling spout. All Tre Mercati products are tested before despatch and our confidence is such that we offer a 10 year guarantee for any defects in manufacture. Chrome plate finishes also carry a 10 year guarantee. Hi, the dimensions of this Tre Mercati Sink Mixer are - h270 x w140mm approx. Reach of spout is 225 mm. Thanks, I hope this helps. Received very quickly after ordering and that was on a standard delivery. Item was well packed and arrived in perfect condition. Very pleased with my purchase which came complete with washers and sealer washers and flexi pipe connectors which I wasn't expecting, so fitting was no problem. I only gave the item 4 stars for build quality as I don't know how long they will last and that will be the real test for me. 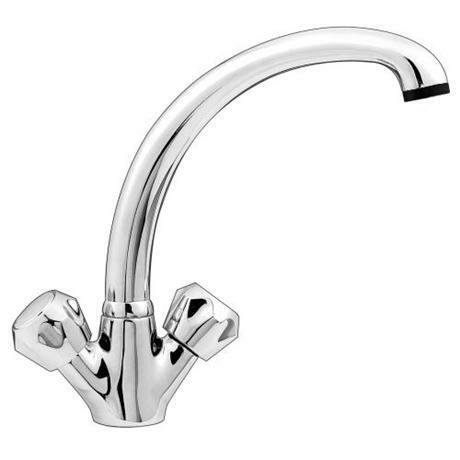 I brought this sink tap as a replacement as my very old tap finally gave up and needed a cheap replacement, this is very good value and does just what it says! I guess you get what you pay for. It looks good but could be a bit sturdier. The main issue is that the hot and cold taps are the wrong way round. Cold on the left, Hot on the right. Fine if you are left handed but odd if you're not.I don't need mine to last and one of the household is left handed so it doesn't bother us too much. Feels a bit odd when you go to fill the kettle though if you are right handed.